This week in our Summer Stargazing series, Paul Kinzer, author of Stargazing Basics, answers our questions about where and when to stargaze and what to look for. And he took all of these fantastic pictures! Head outside tonight and use some of his tips to pick out stars and constellations, then tell us what you saw with the hashtag #WhyIStargaze. Next week, Paul will be back answering questions about how to look for planets and what exciting cosmic events we can expect this summer. It’s summer in the northern hemisphere. What’s in store for the night sky? Every year, as the earth travels around the sun, what we see in the night sky changes slowly from night to night. Each season has its own associated section of sky, with particular stars, constellations, and deep-sky objects. Summer is the season of the Milky Way, our own galaxy; a huge spiral island of more than a hundred billion stars. The brightest part of it that we can see, looking toward the center of this vast whirlpool of stars in which we live, stretches from horizon to horizon once the sky gets dark in mid-summer. For those of us in the northern hemisphere, the center of the Milky Way actually appears quite far in the south, in the constellation Sagittarius, the Archer. But, under dark skies, the glowing band of our galaxy reaches up from there through constellations such as Aquila, the Eagle; then through Cygnus, the Swan, straight overhead; and then grows dimmer as it continues to the north past Cassiopeia, the W-shaped Queen. The band is not uniform. There are brighter ‘star clouds’, as well as dark rifts, caused by vast clouds of interstellar dust. Scanning the Milky Way with binoculars, it’s easy to get lost in the densely packed stars, star clusters, and fuzzy nebulae. Of course, summer nights are short, so it’s quite late by the time skies get truly dark, and the dark doesn’t last long. But the nights are also warm, so spending time outside, sitting or lying quietly, is more pleasant than at other times of year. Unfortunately for most people now, the Milky Way cannot be seen from anywhere near where they live. Artificial lighting is so bright that the dim light of our galaxy is washed out and invisible. Dark sites are needed to see it, and they’re worth getting to. If I live in a bright city, how can I get the best view of the stars? The short answer is: get away from the bright city. Artificial light both washes out the light of the night sky when that light shines upward, and it also keeps your eyes from adjusting to the dark if the light is shining at you. In many very large cities, only a few dozen stars, of the several thousand possible, are ever visible. Your best choice is to get as far away form human-made light as you can. Even then, far-off cities can create light domes that block the view of the (mostly) dim sky. 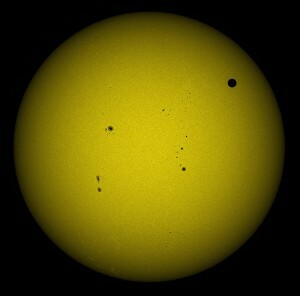 This photo shows the details possible to view on the surface of the sun, with a very round visitor: the planet Venus. It crossed the face (this is called a ‘transit’) of the sun on June 5th, 2012 (in the USA), and won’t do so again until December 2117. Mercury transits more often, more than a dozen times per century, and will do so on May 9th, 2016, and again on November 11, 2019. But Mercury is much smaller than Venus, and also much farther away from us, so it looks very tiny on the face of our star. But, there’s more than stars up in the night sky. The planets, some of them, anyway, can often be seen, even from the brightest cities. In fact, a couple (Jupiter and Venus) can be seen during the day, if you know where to look. Then, of course, there’s the moon. There’s no other object in the sky that can show us as much detailed real estate. It’s up there many nights — and days — each month as it orbits the earth, and each of those nights (and days) shows us a different view as the day/night line moves across the moon’s surface. And, finally, don’t forget the sun! With a proper solar filter (always placed on the end facing the sun), even a small scope will show the changing sunspots that are usually there. Sunspots are solar storms, and the sun has an eleven-year cycle over which the number of spots rises and falls. We are currently near the peak of the current cycle. What’s the best time to stargaze? To see the most possible, it is best to observe with no moon in the sky, either before it rises, after it sets, or around new moon when it won’t come out at all. The moon washes out the light of everything else. Weather can impact the steadiness of the skies (what astronomers call the ‘seeing’, and moisture can dim the view (or ‘transparency’). There are websites that give astronomy forecasts. The one I use is cleardarksky.com. Some would say that winter is better than summer because we have so many more dark hours each night, but of course it’s also cold, if we live in the places where it gets cold. Of course, it really depends on your interest. If it’s the moon you love, any time, even during the day, can work. If it’s our own star you want to gaze at, then only the day will do. If it’s planets you want to see, you have to follow them when and where they go in their travels around the sky. But if it is wide swaths of star-filled sky you want to see, then the best time is whenever you can get to the darkest place you possibly can on a clear, still night without a moon. Which bright stars should I pay attention to? Why are they noteworthy? There are three bright stars that shine high overhead when the Milky Way is at its highest, after midnight at mid-summer, and earlier as the weeks go by. Earlier in the evening (and the summer) they are in the eastern sky. Together these three stars what stargazers call the Summer Triangle. It’s not one of the 88 internationally recognized constellations, but just a group of stars that observers find interesting (such groups are called ‘asterisms’). In fact, each star of the Summer Triangle is in a different constellation. The brightest, Vega, is in the small constellation Lyra, the Harp. Vega is a bright blue star — the fifth brightest in the sky — that lies about 25 light years away. Vega is about twice as massive as the sun, so, even though it is younger, it will use up its nuclear fuel much more quickly, and end its life as a white dwarf in about half a billion years. Every one of the thousands of visible stars in the sky, and the billions and trillions too dim to see without aid, has its own story to tell. It’s a humbling but wonderful thing to think about, especially when you’re outside at night, looking up. The next brightest of the three is Altair, the twelfth brightest star in the night sky. It is about 16.7 light years away, in the constellationAquila, the Eagle. It is less massive than Vega, which is why it does not shine as brightly in our sky, even though it is closer to us. Because it is so close to the sun, as stars go, scientists have been able to study Altair in greater detail than many other stars. It spins so fast (rotating in just nine hours; the sun takes more than 25 days), that it is much wider at the equator than at the poles, giving it an oblong shape. 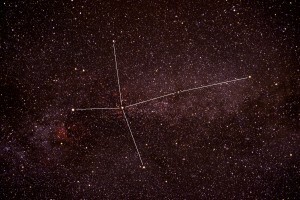 The dimmest star in the Summer Triangle is Deneb, the star that marks the tail of Cygnus, the Swan. But it is still the nineteenth brightest star in the sky. And if it were as close to us as the other two, it would shine far more brightly. Deneb is about 100 times farther away than Vega, about 2600 light years (though star distances are hard to measure accurately when this large; it might be ‘only’ 1600 light years away). Deneb is a huge blue-white star, with a diameter over 100 times that of the sun and it is at least 100,000 times as bright. It is young, and is so massive that it will die in a supernova within a few million years. Every one of the thousands of visible stars in the sky, and the billions and trillions too dim to see without aid, has its own story to tell, and astronomers are actively studying millions of them. It’s a humbling but wonderful thing to think about, especially when you’re outside at night, looking up. Which constellations can I look for? The shape of the Northern Cross is shown in this image of Cygnus. Notice the North America Nebula beneath the star Deneb. The red color visible in photos is caused by ionized hydrogen gas. Well, now that you know about the Summer Triangle, if you can find it, you should be able to locate the three constellations that contain its stars. The brightest stars of Cygnus are often called the Northern Cross. Cygnus is fairly easy to find once you’ve done it once, but it lies right along the band of the Milky Way, so the first time can be tricky. A star chart, or planisphere, will be very helpful for finding it, and any of the others I describe. Vega is, by far, the brightest star in the constellation Lyra, but because Lyra is located a bit away from the Milky Way, finding the rest of this small group of stars is easy. There are four fairly bright stars that form a parallelogram, and there is a sort of line that travels from Vega, through the parallelogram, and then towards the star Altair. 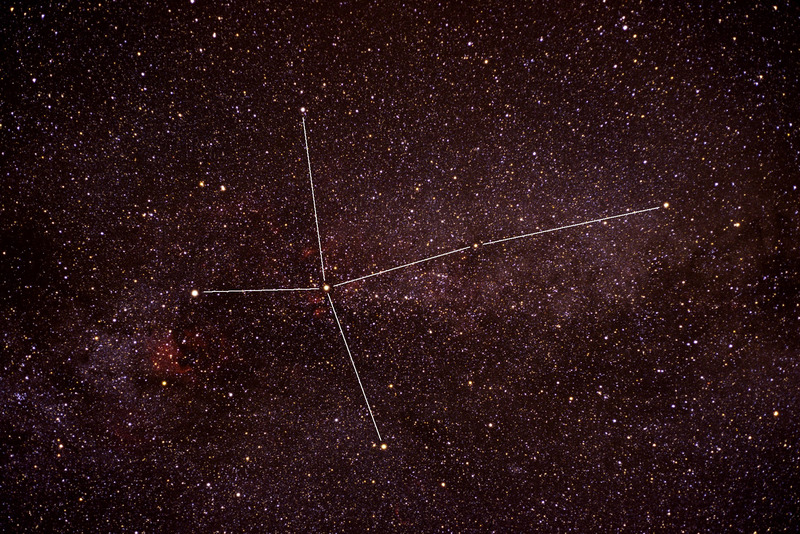 Aquilathe Eagle lies to the south of Cygnus, also along the plane of the Milky Way. Altair is its only really bright star, so if you find it and look south, you are looking at Aquila. For observers south of about 45 degrees latitude, you should be able to locate the ‘Teapot’ asterism that makes up much of the constellation Sagittarius. It lies low in the south on summer evenings. (If you live further north, part of it might be below the southern horizon.) It is below Aquila, so if you can find the Eagle, just go down to find the Teapot. If the Milky Way is visible from your viewing location, just follow it to its most southerly horizon, and the Teapot will be there, with the star fields of our galaxy looking like steam rising from the spout. 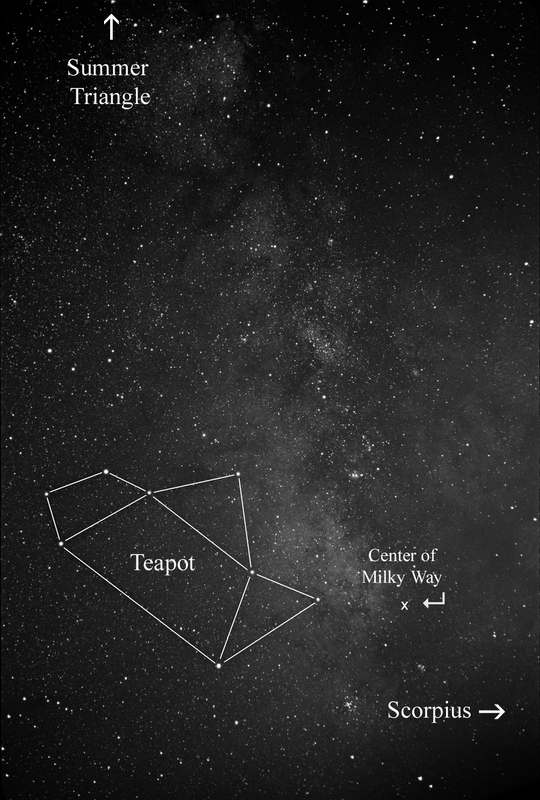 Once you find the Teapot, look to its right, across the Milky Way, and there you’ll find Scorpius, the Scorpion. The two stars that make up the tip of the Scorpion’s stinger, are sometimes called the Cat’s Eyes. The red star that marks the heart of the scorpion is the red super-giant star Antares. The name of the star comes from the Greek for ‘rival of Mars’, and it’s a fitting name because the Red Planet sometimes passes close by. 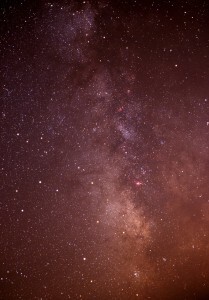 Here is the Central region of the Milky Way, shown as it might look to the eye under dark skies. Don’t miss Part 2 of our Q&A with Paul Kinzer, coming next Friday!